Tonight Alive are headed to Mr. Smalls Theatre in Millvale, PA on March 1st for The Get Free Tour, Co-Headlined with Silverstein and support from Broadside and Picturesque. Most recently, Tonight Alive released “Crack My Heart,” the brand new single from upcoming album Underworld. On the track, Singer Jenna McDougall shares “The concept of cracking the heart is to allow the precious, vulnerable self to come through and be free. The painful, yet liberating experience involves the emotional and energetic decalcification of the hardened heart. The lyrics follow my conversation with a ‘winged man’, a conscious figure, who offers space and safety to do my healing with. In my experience, when you are seen as your authentic self by another, you come to recognise your reflection more accurately and lovingly. Crack My Heart is a tribute to the way that love from the divine masculine elevates and holds space for the divine feminine to flourish.” Fans can head to http://smarturl.it/CrackMyHeartVideo to check out the accompanying music video. Musically, the upcoming album gives fans unique melodies and heavy hitting rock sounds. Lyrically, it is the most personal work they have ever put forth. With additional guest vocal performances from Lynn Gunn (PVRIS) and Corey Taylor (Slipknot, Stone Sour) on the tracks “Disappear” and “My Underworld,” the album is full of moments that pushed the band to explore every aspect of themselves both creatively and emotionally. Due out January 12th, 2018 via Hopeless Records, Underworld is available for pre-order at http://smarturl.it/TAUnderworld. The lead single from the upcoming release, “Temple,” was shared with fans earlier this fall and saw great streaming success with adds to Spotify’s Rock This, The Scene and Crash Course Playlists in the US, a coveted New Music Friday add in Thailand and spots on iTunes’ Best of the Week and A-List: Rock Playlists in the UK. Born out of a time when McDougall was experiencing severe depression and fatigue, the lyrics for this super-charged and energetic track were penned when she was entrapped in being sick in her mind, body and soul. Be sure to check out the video for the hard-hitting, yet deeply personal track, here: smarturl.it/TempleVideo. Tonight Alive recently announced they will be returning to the United States for a Co-Headlining Tour with Silverstein in early 2018. 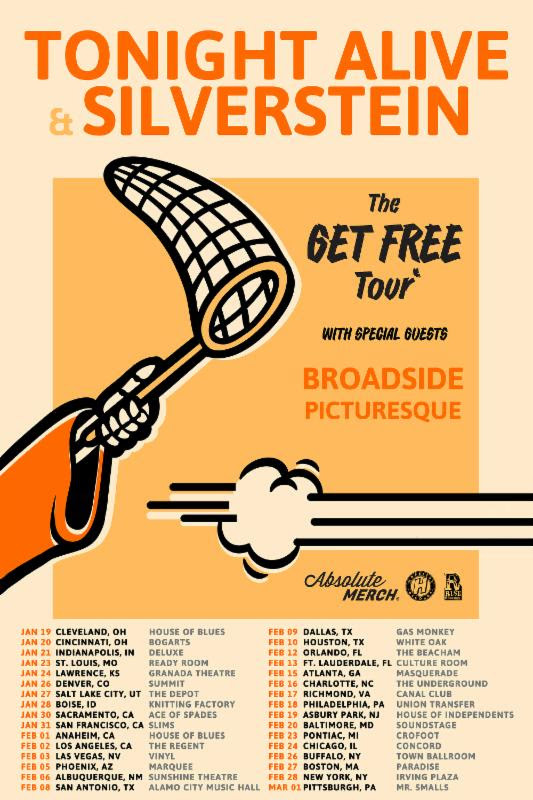 With support from Broadside and Picturesque, The Get Free Tour will kick off in Cleveland, OH on January 19th and travel to cities all around the United States before wrapping up on March 1st in Pittsburgh, PA. Tickets are on sale now at http://tonightalive.com/. 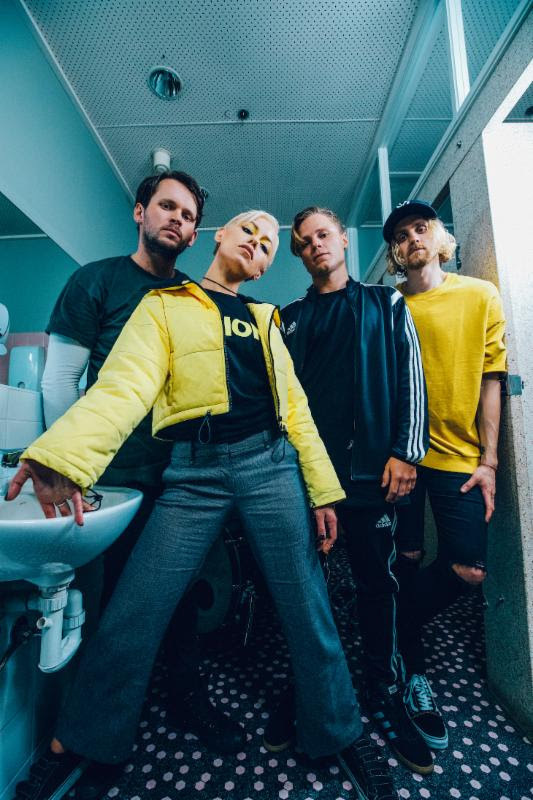 Tonight Alive, the now 4 piece since departure of guitarist & writer Whakaio Taahi is composed of vocalist Jenna McDougall, rhythm guitarist Jake Hardy, bassist Cameron Adler and drummer Matt Best. After self-releasing the EPs All Shapes & Disguises and Consider This in 2010, Tonight Alive released What Are You So Scared Of? in2011/2012. In 2013 the band released The Other Side. The band also contributed the song “The Edge” to The Amazing Spider-Man 2 Soundtrack before releasing their third full length album, Limitless in 2016.